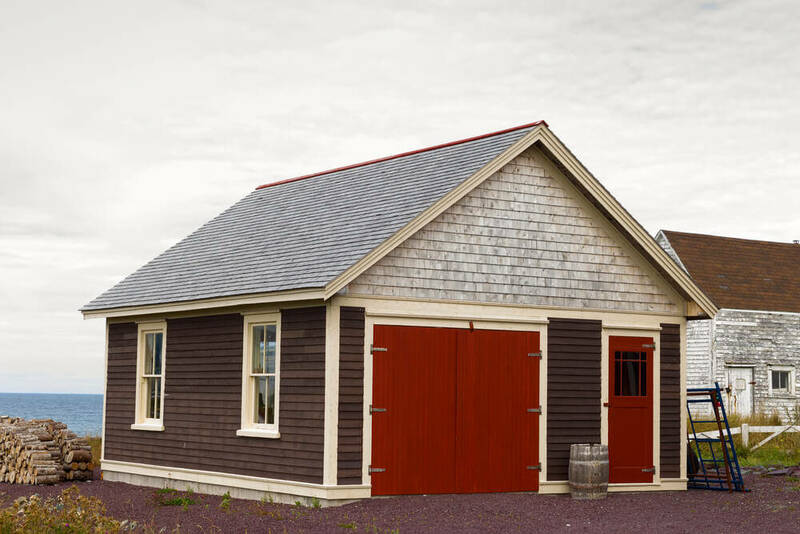 There are a lot of reasons to buy a wooden garage over a metal one. For one thing, it isn’t such an eyesore. Metal shacks aren’t particularly attractive, while wooden ones are more rustic and can help set a ton for your property. Another reason is the value it adds to your house. You would be surprised by how much difference it can make in the price tag if or when you choose to sell your home. It is considered an upgrade and can be a deciding factor for a buyer. It stands out, where a metal garage is just something people ignore other than ascertaining the size. 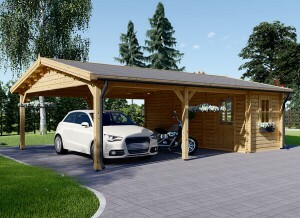 But if you get a wooden garage you need to care for it properly. One way to do that is by installing some rain pipes to the outside. Rain pipes? Aren’t those just for houses? Actually, they are critical for any structure, regardless of material. But with a lumber based dwelling of any kind it is especially critical. Wood is a sturdy material and it will last a long time. 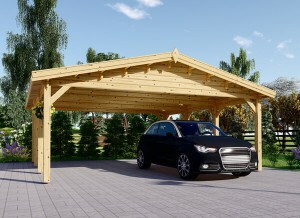 It isn’t unusual for a wooden garage to go generations without needing a single major repair. However, wood has to be maintained in order for that to be true. We all know about keeping it clean, staining it every three to five years and making sure there are no holes, gaps, cracks or warping in the logs. That is just common sense. What you might not know is that any moisture can still make its way into the wood if you let it sit for too long. Rain pipes will keep water from gathering at the base of your garage and rotting the wood. 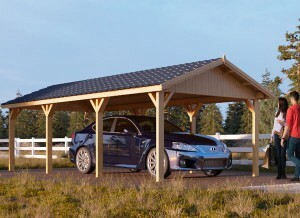 It will also keep the roof from becoming damaged by heavy rainfall or snowfall through different seasons. How Much Does It Cost To Install Rain Pipes On a Wooden Garage? Gutters don’t cost much to buy because the materials themselves are cheap and available at any hardware store. There are two different types for you to choose from. The first is galvanized aluminum pipes, which you have probably seen on many houses as they tend to run standard. These cost an average of $4 to $6 per foot and can be bought in long or short pieces so you can construct the perfect size system for your wooden garage. The second type is a more modern style made of vinyl. While not as sturdy, they hold up well against most inclement weather and cost around $3 to $5 per foot. Not only are these less noisy in wind (we have all heard the irritating sound of wind rushing through metal pipes, which can be very distracting), but they are much lighter weight and easier to install. If you live in an area with especially heavy rain you will want to stick with the galvanized aluminum. But if your area’s seasons come and go the vinyl can be a good option that is a little cheaper and easier to manage. Keep in mind that if there is any damage to the siding of your wooden garage you may have to repair that first before installing the pipes. Should I Do It Myself, Or Hire Someone? This is where most people get tripped up. If you look it up most people will claim that this is a very simple job that doesn’t require any previous experience. Most gutters come with instructions and you can find videos and guides online that will help you step by step. If you use the vinyl it is supposed to be especially easy, so experts will point you in that direction and tell you to have at it. The truth is that it might not be that easy. 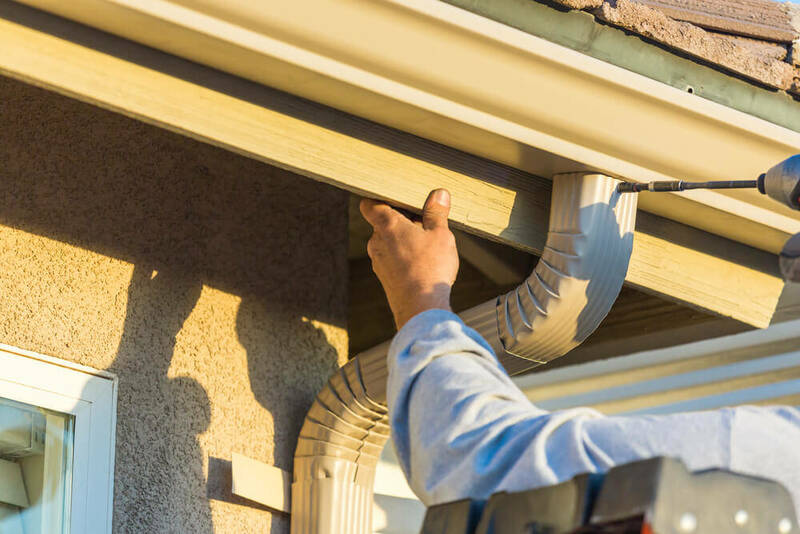 Installing gutters is a big undertaking that takes quite a bit of time and effort to do. Doing it on your own can be especially taxing if no one is there to help hold it up while you secure it, hand you further pieces or make sure it is being laid evenly (uneven piping can lead to clogs or less efficient water runoff. Hiring someone may be much easier than doing it yourself. The job will usually take professionals around three hours to complete and labor averages between $150 and $200 for most jobs. 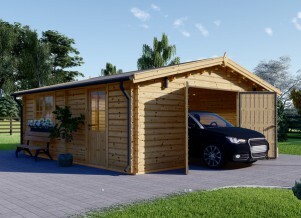 If your garage is smaller it may be much faster and so cheaper than that. Your best bet is to go around looking for local bids and having the square footage needed when you call. Try to find someone in the midrange of the pricing, so you can be sure you are getting quality work for a reasonable price. Plan the project properly. Draw out a simple sketch of your garage and its dimensions. Locate the best areas for the downspouts where the water can be pushed most effectively away from the structure. Prepare your pipes. You will need to assemble your piping before you try and put it up, because sliding it in place in large pieces is difficult and dangerous. You may want to consider taking your dimensions and plans to a hardware store and having them precut them for you and show you how to assemble them. Have someone to help you. Trying to hang gutters on your own isn’t impossible, but it can be difficult. Having someone there to secure the ladder, help keep it in place, help raise the preassembled pipes and make sure everything is straight will save you a major headache later on. There are two other accessories you may want to consider getting. The first is an extender that pushes the water further from your wooden garage. 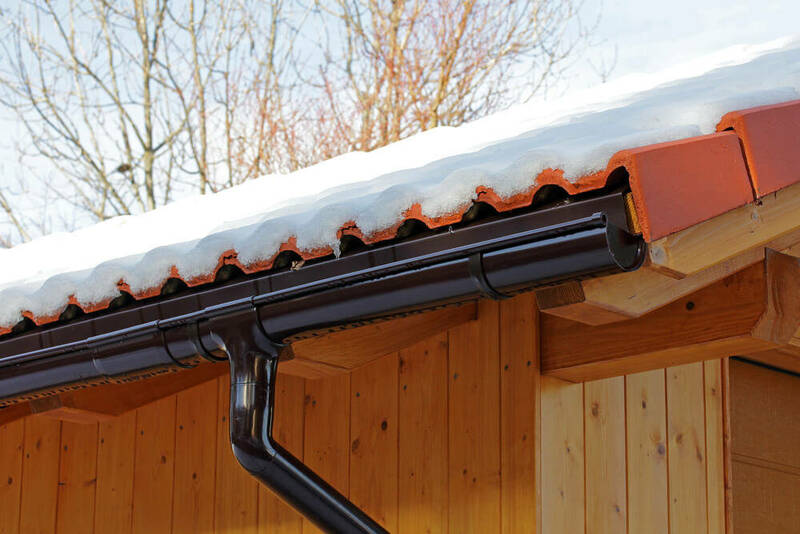 The second are gutter covers that can be snapped into place during certain seasons to keep gunk from getting inside and keep them protected from snowfall, which can weight them down and cause the pipes to snap off.